MOST of the world’s population will be wiped out if political leaders fail to agree a method of stopping current rates of global warming, one of the UK’s most senior climate scientists has warned. Professor Kevin Anderson, director of the Tyndall Centre for Climate Change, believes only around 10 per cent of the planet’s population – around half a billion people – will survive if global temperatures rise by 4C. Anderson’s warning comes just eight days before global leaders meet in Copenhagen for the most crucial talks on climate change reversal since the Rio summit in 1992. Current Met Office projections reveal that the lack of action in the intervening 17 years – in which emissions of climate changing gases such as carbon dioxide have soared – has set the world on a path towards potential 4C rises as early as 2060, and 6C rises by the end of the century. Anderson, who advises the government on climate change, said the consequences were “terrifying”. “For humanity it’s a matter of life or death,” he said. “We will not make all human beings extinct as a few people with the right sort of resources may put themselves in the right parts of the world and survive. Efforts at the Copenhagen summit, which starts on 7 December, will focus on action to instead keep temperature rises to no more than 2C – generally accepted as the threshold for dangerous climate change. However, with growing pessimism that a binding agreement on emissions reduction targets will be reached, Anderson warned time was running out. If ambitious global targets for reductions have not been set by the end of next year, he believes it will be too late to stop emissions rising beyond 2C. Last week, Britain and France urged the wealthiest nations to set aside $10 billion annually over the next three years to help poorer countries reduce the output of greenhouse gases. Scotland has set a 42 per cent emissions reduction target for 2020 but Anderson pointed out that even if this was achieved by rich nations throughout the world, it would only give a 60 per cent chance of avoiding a 2C global temperature increase. Despite pessimism over the past few weeks he was optimistic a legal agreement can still be reached at Copenhagen. He believes leaders are deliberately trying to lower expectations to increase the impact of any success at the summit. “The worst possible result at Copenhagen is a bad deal where the world leaders have to come home and say it’s a good deal when its rubbish,” he added. Is It Too Late to Prevent Catastrophic Climate Change? An Understanding of Where We Are at Today With Climate Change. This is a must read. This paper lays out the latest scientific understanding of the task humanity faces to avoid catastrophic climate change.2 One of the most striking features of the global warming debate has been how, with each advance in climate science, the news keeps getting worse. Although temporarily slowed by the effects of the 2008 global financial crisis, the world’s greenhouse-gas emissions have been growing much faster than predicted in the 1990s. In addition, since 2005 a number of scientific papers have described the likelihood of the climate system passing significant ‘tipping points’— small perturbations that cause large changes—beyond which the warming process is reinforced by positive feedback mechanisms.3 The paleoclimate record shows the Earth’s climate often changing abruptly, flipping from one state to another, sometimes within a few years.4 It now seems almost certain that, if it has not occurred already, within the next several years enough warming will be locked in to the system to set in train feedback processes that will overwhelm any attempts we make to cut back on our carbon emissions. We will be powerless to stop the jump to a new climate on Earth, one much less sympathetic to life. 1 Charles Sturt Professor of Public Ethics, Centre for Applied Philosophy and Public Ethics at the Australian National University (clive.hamilton@anu.edu.au). 2 It is adapted from Chapter 1 of my forthcoming book, Requiem for a Species. For reviewing the chapter I am very grateful to Alice Bows of the Tyndall Centre for Climate Change Research, Andrew Glikson of the Australian National University, Graeme Pearman of Monash University and Mike Raupach of the CSIRO. 3 For example, Tim Lenton et al., ‘Tipping elements in the Earth’s climate system’, Proceedings of the National Academy of the Sciences, vol. 105, no. 6, 12 February 2008. 4 Jørgen Peder Steffensen et al., ‘High-Resolution Greenland Ice Core Data Show Abrupt Climate Change Happens in Few Years’, Science, vol. 321, no. 5889, 1 August 2008. Graeme Pearman notes that these abrupt changes may have been due to rapid deglaciation coming out of the last ice age, ‘a process that would not be applicable to Earth which is already substantially more deglaciated’ (pers.comm.). 5 Others, such as the UK Met Office’s Vicki Pope, believe the recent sharp decline could be due to natural variation but that over the longer term human-induced warming will lead to the disappearance of Arctic sea-ice in the summer. Vicki Pope, ‘Scientists must rein in misleading climate change claims’, The Guardian, 11 February 2009. 11 Garnaut, The Garnaut Climate Change Review, Table 3.2, p. 65. In which year, the US is expected to account for 11 per cent (down from 18) and India 8 per cent (up from 4.6 per cent). emissions of 2.5 per cent per annum through to 2030, yet we have seen that from around 2000 global emissions began growing at around three per cent a year.14 This worse-than-the-worst case scenario should now be regarded as the most likely one in the absence of determined intervention.15 It is not only the dramatic increase in the growth rate of global emissions that is turning alarm into panic; advances in climate science have made the future appear more grim than we imagined. In particular, anthropogenic warming is likely to disrupt the natural carbon cycle. This is not place to describe the carbon cycle in any detail,16 except to note that when we dig up and burn coal over half of the CO2 released is absorbed by land and ocean sinks. The rest stays in the atmosphere, some of it for a very long time. A quarter will still be affecting the climate after a thousand years and around 10 per cent after a hundred thousand years. Through global warming, changes in atmospheric carbon alter the rate of absorption and release of carbon from natural sinks in the oceans and land. Climate-carbon cycle feedback mechanisms include the reduced ability of warmer ocean waters to remove CO2 from the atmosphere, and the decline in deep-ocean mixing and thus the transportof carbon into the deep ocean from the carbon-rich surface layer. In addition, warming is expected to cause more deforestation through droughts, fires and high temperatures inhibiting plant growth. When ocean and land sinks take up less carbon, a greater proportion of the CO2 put into the atmosphere by humans stays there, strengthening feedback effects and causing more warming. Perhaps most worrying, the threshold for release of methane and CO2 from the vast permafrost of Siberia is approaching, driven by temperature rise in the Arctic which at nearly 4°C is three to four times the global average. 14 See also Katherine Richardson et al., Synthesis Report, from the Climate Change: Global Risks, Challenges & Decisions conference, University of Copenhagen, Copenhagen, 2009, Box 2. 15 Recent observed climate trends are compared to the model projections contained in the 2001 IPCC report by S. Rahmstorf, A. Cazenave, J. A. Church, J. E. Hansen, R. F. Keeling, D. E. Parker and R. J.C. Somerville, ‘Recent climate observations compared to projections’, Science, vol. 316, no. 5825, 2007.
before the Bali climate change conference at the end of 2008 climate scientists released a new assessment arguing that in order to have a good chance of avoiding the 2°C threshold rich countries must by 2020 reduce their greenhouse-gas emissions by 25-40 per cent below 1990 levels.23 The 25 per cent target quickly became entrenched internationally as the benchmark against which the commitment of rich countries is judged. The fact that aiming for 25 per cent instead of 40 per cent means developing countries will have to do a lot more was conveniently passed over. 23 See, e.g., Bill Hare, Michiel Schaeffer and Malte Meinshausen, ‘Emission reductions by the USA in 2020 and the risk of exceeding 2°C warming’, Climate Analytics, March 2009.
eliminates the possibility of near-term return of atmospheric composition beneath the tipping level for catastrophic effects. 24 Meeting in March 2009 the world’s leading climate scientists reached a similar conclusion: ‘immediate and dramatic emission reductions of all greenhouse gases are needed if the 2°C guardrail is to be respected’.25 The urgent question we must now ask ourselves is whether the global community is capable of cutting emissions at the speed required to avoid the Earth passing a point of no return beyond which the future will be out of our hands. It is this irreversibility that makes global warming not simply unique among environmental problems, but unique among all of the problems humanity has faced. Beyond a certain point it will not be possible to change our behaviour to control climate change no matter how resolved we are to do so. If global emissions must reach a peak within 5-10 years then decline rapidly until the world’s energy systems are all but decarbonised, are the institutions of government in the major nations of the world capable of responding in time? Are international institutions capable of agreeing on a global plan adequate to the task? These are questions on which climate scientists have little useful to say; they are in the domain of political and behavioural scientists. However, confidence in the ability of humans to respond with the required urgency is dashed when we understand fully how near we are to the point of no return. Climate scientists have recently adopted the so-called budget approach to describe the task before us. Because CO2 persists in the atmosphere for a very long time,26 it is cumulative emissions that matter, so that the total amount of carbon emissions humans put into the atmosphere over the next decades will determine our fate. A tonne of carbon emitted today counts as much as one emitted in 2050, so setting targets such as an 80 per cent cut in emissions by 2050, which could be attained by any number of emissions trajectories, is misleading and potentially dangerous. anthropogenic or human-induced CO2 emissions.29 Reducing deforestation will need to be a major focus of efforts to minimise climate change. If the world’s decisionmakers adopt a resolute attitude to tackling climate change then an optimistic assessment would see deforestation rates peak in 2015 and fall rapidly thereafter, to around half their current levels by 2040 and close to zero by 2060. 28 All figures below are taken from the analysis by Anderson and Bows. If this happens then the total stock of carbon dioxide locked up in the world’s forests will fall from 1060 billion tonnes in the year 2000 to around 847 billion tonnes in 2100, a decline of 20 per cent.30 Over this century, then, deforestation would add ‘only’ 213 billion tonnes of CO2 to the atmosphere. (A less optimistic scenario would see deforestation add 319 billion tonnes of CO2 to the atmosphere.) What about non-CO2 greenhouse gases? Methane and nitrous oxide are the two main non-CO2 greenhouse gases. In 2000 they accounted for about 23 per cent of the global warming effect of all greenhouse gas emissions.31 They are mostly emitted from agriculture—methane from livestock and rice cultivation and nitrous oxide from the use of fertilisers. Emissions from agriculture are growing rapidly as more land is turned over to crops and pasture, and diets shift to more meat as people in countries like China become better off. Population growth will make the task of reducing non- CO2 emissions harder because food is the first item of consumption humans must have. Like emissions from deforestation, agricultural emissions must peak soon then decline. Unlike emissions from deforestation, they cannot be reduced to zero because of the nature of food production. If the world’s leaders take resolute action, an optimistic assumption would be that non-CO2 emissions will continue to rise until 2020, up from 9.5 billion tones annually (measured in CO2-e) in 2000 to 12.2 billion tonnes, then fall to 7.5 billion tonnes by 2050, the level at which it stabilises.32 If, as expected, world population increases to a little over nine billion by the middle of the century, these 7.5 billion tonnes of CO2-e allocated to food production must be spread across an additional 2.6 billion people,33 which means that the emissions intensity of food production must be approximately halved over the next four decades. melting of the Siberian permafrost. See M. Rigby et al., ‘Renewed growth of atmospheric methane’, Geophysical Research Letters, vol. 35, L22805, 2008. Social Affairs, New York, 2007). 34 It is, for example, the most optimistic outcome modeled by Hare et al., ‘Emission reductions by the USA in 2020 and the risk of exceeding 2°C warming’. 35 Nicholas Stern, The Economics of Climate Change: The Stern Review, Cambridge University Press,Cambridge, 2007, Box 8.3, p. 231. Anderson and Bows also draw from it. pump out an extra 3,000 billion tonnes of greenhouse gases,39 which would not see atmospheric concentrations of greenhouse gases stabilise at the ‘safe’ level of 450 ppm. Nor would they stabilise at the very dangerous level of 550 ppm. They would in fact rise to 650 ppm! Table 1 shows the calculus of Anderson and Bows in its starkest form. Their analysis has been replicated, with small variations, by other groups.40 A recent report by the German Advisory Council on Global Change (WGBU) assessed what it would take to have a good chance of remaining within the 2ºC guardrail.41 To have a two out of three chance of limiting warming to 2ºC, cumulative global emissions over the next forty years would need to be kept below 750 billion tonnes (or gigatonnes, Gt), with a small residual amount each year beyond 2050. Of course, the first task is to reverse the trend of rising emissions. The relationship between the peaking year and subsequent rates of emissions reductions is shown in Figure 2. 40 One study concluded that to keep warming from exceeding 2°C total anthropogenic emissions must be limited to 3,670 billion tonnes of CO2 (ignoring non-CO2 forcing agents). Half of this amount has already been emitted since the start of the Industrial Revolution in the eighteenth century, leaving a budget of 1,850 billion tonnes for the twenty-first century, or 1,460 billion tonnes if non-CO2 forcings are taken into account (Myles Allen et al., ‘Warming caused by cumulative carbon emissions towards the trillionth tonne’, Nature, vol. 458, 30 April 2009). Anderson and Bows’ analysis shows that, if global emissions peak in 2020 and fall by 3 per cent per annum thereafter, an additional 3,000 billion tonnes of CO2-e will be added to the atmosphere, 60 per cent more than allowed by the 2°C target. The WGBU study concluded that even a delay in the peaking year to 2015 means that global emissions must fall at a rate close to 5 per cent per annum—the entire Kyoto commitment in one year, for many years. Any further delay makes the target impossible. Delaying the peak year even further to 2020 could necessitate global emissions reduction rates of up to 9% per year – i.e. reductions on an almost inconceivable scale, entailing technological feats and social sacrifices on a scale comparable to those of the Allied mobilization during the Second World War.42 John Schellnhuber, head of the Potsdam Institute for Climate Impact Research and lead author of the WGBU report, referred to the areas under the curves that describe carbon budgets as ‘vicious integrals’.43 A study by Meinshausen and others came to a similar conclusion, illustrating in a dramatic way the cost of delaying the peaking year—see Figure 3.44 Some of the steeper paths also require negative emissions from around 2040, which would entail the invention and deployment of large-scale programs to extract carbon from the atmosphere. (The study left out the need for continued unavoidable emissions associated with food production and therefore shows the task to be a little easier than in the analysis by Anderson and Bows). It is clear that limiting warming to 2ºC is beyond us; the question now is whether we can limit warming to 4ºC. The conclusion that, even if we act promptly and resolutely, the world is on a path to reach 650 ppm and associated warming of 4°C is almost too frightening to accept. Yet that is the reluctant conclusion of the world’s leading climate scientists. Even with the most optimistic set of assumptions—the ending of deforestation, a halving of emissions associated with food production, global emissions peaking in 2020 and then falling by 3 per cent a year for a few decades—we have no chance of preventing emissions rising well above a number of critical tipping points that will spark uncontrollable climate change. 43 In a lecture to the ‘Four Degrees and Beyond’ conference at the University of Oxford, 28 September 2009. The Earth seems to be locked on a path leading to a very different climate, a new and much less stable era lasting many centuries before natural processes eventually establish some sort of equilibrium. Whether human beings will still be a force on the planet, or even survive, is a moot point. These conclusions are alarming, to say the least, but they are not alarmist. Rather than choosing or interpreting numbers to make the situation appear worse than it could be, following Kevin Anderson and Alice Bows I have chosen numbers that err on the conservative side, i.e., numbers that reflect a more buoyant assessment of the possibilities. A more neutral assessment of how the global community is likely to respond would give an even bleaker assessment. For example, the analysis excludes non-CO2 emissions from aviation and shipping. It also excludes the effect of aerosols, the tiny particles that mask some of the warming otherwise built in to the system. The clean-up of urban air pollution in China and India—through laws requiring use of cleaner fuels, fitting catalytic converters to vehicles and mandating scrubbers on power plants—would bring on the warming more quickly, perhaps as early as 2060. And, while the analysis incorporates conventional carbon-climate feedback effects—the weakening capacity of land and ocean sinks to soak up carbon—it does not account for the possibility of others such as the ice-albedo effects from Arctic warming that may hasten the approach of a 650 ppm world and take us well beyond it. What does it all mean? 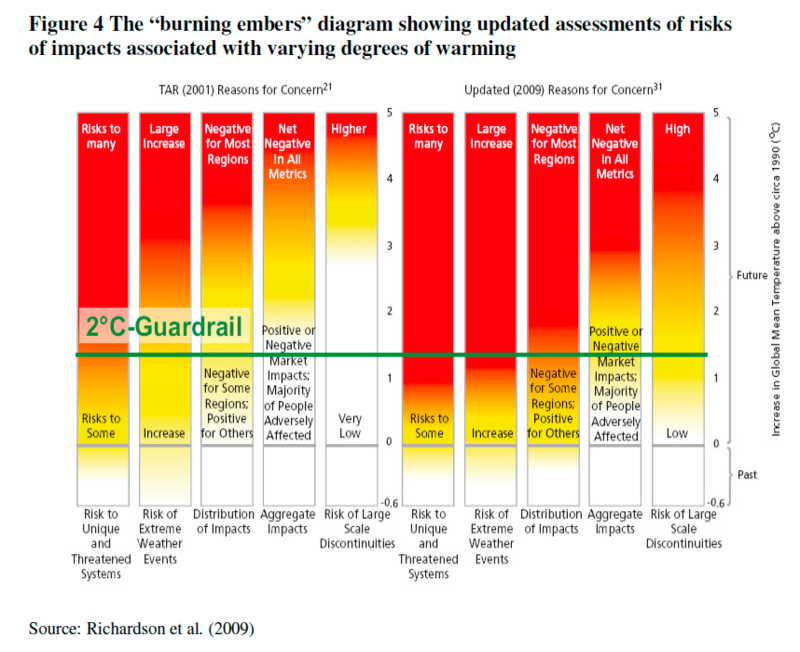 I don’t plan to dwell on the likely impacts of a four-degree world, except to refer to the famous “burning embers” diagram. Figure 4 shows the most recent assessment of the risks of various impacts, with redder areas indicating higher risks.45 Until recently we thought we were reasonably comfortably located in the lower left corner, i.e. that 2°C was an achievable aim and the impacts of 2°C warming were worrying but manageable. With a better understanding of the higher risks of even 2°C of warming, and the realisation that 2°C is unattainable and we will be lucky not to reach 4°C, we suddenly find ourselves in the top right hand quarter of the diagram. These facts must cause us to rethink entirely how the future will play out because the presence of feedback effects and tipping points calls into question some of the most fundamental assumptions of climate change negotiations. The belief that we can stabilise the climate at a specified concentration of greenhouse gases in the atmosphere, with an associated increase in average global temperature, rests on assumptions that are not well founded in the science. The problem is that global warming is likely to trigger its own ‘natural’ sources of new emissions and interferewith the Earth’s capacity to remove carbon from the atmosphere. The Earth’s climate is not like a machine whose temperature can be regulated by turning some policy knobs; it is a highly complex system with its own regulatory mechanisms. Some of the relationships among variables are non-linear, so that a slight increase in warming can cause a large shift in other aspects of the climate. 46 I am grateful to Andrew Glikson and Graeme Pearman for discussions on these themes. vol. 4, 2009. In the simulation where emissions are set to zero in 2050 as concentrations reach 550 ppm CO2, the temperature rises by an additional 0.2°C through to 2150. 2 or more degrees of warming by adapting to it—have no foundation in the way the Earth’s climate system actually behaves. When one understands these facts, the state of political debate around the world takes on an air of unreality. Rich country policies—including cutting emissions by a few per cent and outsourcing most of the cuts to developing countries; waiting for carbon capture and storage technology to save the coal industry and continuing to pollute at high levels until that happens; planning the construction of new coal-fired power plants; and even, in Australia, entertaining the idea of exporting brown coal—are so at odds with the scale and urgency of the emission cuts demanded by the science as to be almost laughable. They reflect a child-like belief that climate change can be averted by ignoring the truth and hoping for the best, a form of wishful thinking whose costs will prove incalculable. We moderns have become accustomed to the idea that we can modify our environment to suit our needs, and have acted accordingly for some three hundred years. We are now discovering that our intoxicating belief that we can conquer all has come up against a greater force, the Earth itself. We are discovering that humans cannot regulate the climate; the climate regulates us. The prospect of runaway climate change challenges our technological hubris and our Enlightenment faith in reason. The Earth may soon demonstrate that, ultimately, it cannot be tamed and that the human urge to master nature has only roused a slumbering beast. Although the 6C rise and its potential disastrous effects have been speculated upon before, this is the first time that scientists have said that society is now on a path to meet it. Their chilling and remarkable prediction throws into sharp relief the importance of next month’s UN climate conference in Copenhagen, where the world community will come together to try to construct a new agreement to bring the warming under control. For the past month there has been a lowering of expectations about the conference, not least because the US may not be ready to commit itself to cuts in its emissions. But yesterday President Barack Obama and President Hu Jintao of China issued a joint communiqué after a meeting in Beijing, which reignited hopes that a serious deal might be possible after all. It cannot come too soon, to judge by the results of the Global Carbon Project study, led by Professor Corinne Le Quéré, of the University of East Anglia and the British Antarctic Survey, which found that there has been a 29 per cent increase in global CO2 emissions from fossil fuel between 2000 and 2008, the last year for which figures are available. On average, the researchers found, there was an annual increase in emissions of just over 3 per cent during the period, compared with an annual increase of 1 per cent between 1990 and 2000. Almost all of the increase this decade occurred after 2000 and resulted from the boom in the Chinese economy. The researchers predict a small decrease this year due to the recession, but further increases from 2010. In total, CO2 emissions from the burning of fossil fuels have increased by 41 per cent between 1990 and 2008, yet global emissions in 1990 are the reference level set by the Kyoto Protocol, which countries are trying to fall below in terms of their own emissions. The 6C rise now being anticipated is in stark contrast to the C rise at which all international climate policy, including that of Britain and the EU, hopes to stabilise the warming – two degrees being seen as the threshold of climate change which is dangerous for society and the natural world. The amount of CO2 that has remained in the atmosphere as a result has increased from about 40 per cent in 1990 to 45 per cent in 2008. This suggests that the sinks are beginning to fail, they said. Professor Le Quéré emphasised that there are still many uncertainties over carbon sinks, such as the ability of the oceans to absorb dissolved CO2, but all the evidence suggests that there is now a cycle of “positive feedbacks”, whereby rising carbon dioxide emissions are leading to rising temperatures and a corresponding rise in carbon dioxide in the atmosphere. “Our understanding at the moment in the computer models we have used – and they are state of the art – suggests that carbon-cycle climate feedback has already kicked in,” she said. “These models, if you project them on into the century, show quite large feedbacks, with climate amplifying global warming by between 5 per cent and 30 per cent. There are still large uncertainties, but this is carbon-cycle climate feedback that has already started,” she said. The study also found that, for the first time since the 1960s, the burning of coal has overtaken the burning of oil as the major source of carbon-dioxide emissions produced by fossil fuels. Much of this coal was burned by China in producing goods sold to the West – the scientists estimate that 45 per cent of Chinese emissions resulted from making products traded overseas. It is clear that China, having overtaken the US as the world’s biggest carbon emitter, must be central to any new climate deal, and so the communiqué from the Chinese and US leaders issued yesterday was widely seized on as a sign that progress may be possible in the Danish capital next month. Presidents Hu and Obama specifically said an accord should include emission-reduction targets for rich nations, and a declaration of action plans to ease greenhouse-gas emissions in developing countries – key elements in any deal. If two degrees is generally accepted as the threshold of dangerous climate change, it is clear that a rise of six degrees in global average temperatures must be very dangerous indeed, writes Michael McCarthy. Just how dangerous was signalled in 2007 by the science writer Mark Lynas, who combed all the available scientific research to construct a picture of a world with temperatures three times higher than the danger limit. His verdict was that a rise in temperatures of this magnitude “would catapult the planet into an extreme greenhouse state not seen for nearly 100 million years, when dinosaurs grazed on polar rainforests and deserts reached into the heart of Europe”. Very few species could adapt in time to the abruptness of the transition, he suggested. “With the tropics too hot to grow crops, and the sub-tropics too dry, billions of people would find themselves in areas of the planet which are essentially uninhabitable. This would probably even include southern Europe, as the Sahara desert crosses the Mediterranean. “As the ice-caps melt, hundreds of millions will also be forced to move inland due to rapidly-rising seas. As world food supplies crash, the higher mid-latitude and sub-polar regions would become fiercely-contested refuges. No more business as usual: This is an emergency! Global warming – No more business as usual: This is an emergency! October 10, 2008 — A year ago I was researching what was intended to be a short submission to the Garnaut review [commissioned to advise the Australian federal government of Labor Party Prime Minister Kevin Rudd], when events in the polar north turned the world of climate policy upside down. It was found that eight million square kilometres of sea-ice — an area the size of Australia — was melting, in the immortal words of one glaciologist, “a hundred years ahead of schedule”. We came to the conclusion that most of the public policy debate on climate is delusional, that is, a fixed, false belief resistant to reason or confrontation with actual fact. In the new Quarterly Essay, Tim Flannery says “There is no real debate about how serious our predicament is”, nor has there been the “understanding of just how profoundly we are influencing the very Earth processes that gives us life”. The Australian federal government’s climate vision does not extend beyond the terrain described by the reports of the IPCC, which Flannery notes are “painfully conservative” because the IPPC “works by consensus and includes government representatives from the United States, China and Saudi Arabia, all of whom must assent to every word of every finding”. Thus the IPCC’s most recent report has already been found badly wanting on such issues as the Arctic sea-ice, ice sheet loss and sea-level rises, nor did it not seriously concern itself with the possibilities of non-linear climate change and the long-term effects of carbon-cycle feedbacks (carbon emission-induced warming causing the release of more carbon into the air, for example by the melting of permafrost). Put simply, the debate in Australia is not evidence based. Political pragmatism, window dressing and incremental solutions that will fail take precedence over the scientific imperatives. The result can only be a suicide note for most people and most species on the planet. The conclusion we came to was that unless we adopt the strongest measures — emergency action — it will be too late. It is no longer a matter of how much more we can heat the planet, but how quickly can we cool it. Serious climate-change impacts are already happening, both more rapidly and at lower global temperature increases than projected. In 2005 the eminent climate scientist Dr James Hansen warned that: “We are on the precipice of climate system tipping points beyond which there is no redemption.” Three years later, we now know that we have already crossed some of those tipping points: for ice-sheet disintegration, significant sea-level rises and species loss. Hansen says that the “Elements of a `perfect storm’, a global cataclysm, are assembled”. The Arctic is key to the world’s climate, and Arctic changes have the potential to seriously destabilise the global climate system. Dr Neil Hamilton, Director of the World Wildlife Fund (WWF) Arctic programme, says that Arctic climate models are breaking down and no longer work because “we are moving to a new Arctic climate system”. He says the WWF is no longer trying to protect the Arctic ecosystem because it is no longer possible to do so, and that carbon sinks in the Arctic are changing very, very quickly and it is not clear what any Arctic ecosystem will look like in 50 years. The danger is that an ice-free state in the Arctic summer will kick the climate system into run-on warming and create an aberrant new climate state many, many degrees hotter. The Arctic sea-ice is the first domino and it is falling fast. Other dominos will inevitably fall unless we stop emitting greenhouse gases and cool the planet to get the Arctic sea-ice back. Those dominoes include the Greenland ice sheet. The loss of the Arctic summer sea-ice will cause a large local warming in the Arctic region of around 5ºC and a smaller but very significant global warming of around 0.3ºC. This further warming of the Arctic will add to the speed of disintegration of the Greenland ice sheet. “We are close to being committed to a collapse of the Greenland ice sheet”, says Tim Lenton of the University of East Anglia. If Greenland totally melts, global sea levels will rise by 7 metres. The question, given the present trajectory of the climate system is not if, but how fast? The general view is 1–2 metres this century, but Will Steffen of the ANU says 4 metres cannot be ruled out; in past climate history 14,000 years ago, sea levels rose as fast as 5 metres per century. I are not aware of any well-informed climate scientist who thinks that it is possible to have a safe climate or avoid dangerous sea-level rises with the permanent loss of the Arctic summer sea-ice. This topic is not being addressed in Australia, though it must frame the whole debate. To not forcefully consider the Arctic is to ignore the biggest issue today in global warming. The rapid regional warming consequent to the sea-ice loss also has grave repercussions for the permafrost. The National Centre for Atmospheric Research in Boulder predicts that half of the permafrost in the Arctic north will thaw to a depth of 3 metres by 2050. Glaciologist Ted Scambos says, “That’s a serious runaway … a catastrophe lies buried under the permafrost.” Permafrost specialist Sergei Zimov says: “Permafrost areas hold 500 billion tonnes of carbon, which can fast turn into greenhouse gases … If you don’t stop emissions of greenhouse gases into the atmosphere … the Kyoto Protocol will seem like childish prattle.” The western Siberian peat bog is amongst the fastest-warming places on the planet, and Sergei Kirpotin of Tomsk State University calls the melting of frozen bogs an “ecological landslide that is probably irreversible”. In August 2008, Örjan Gustafsson, the Swedish leader of the International Siberian Shelf Study confirmed that methane was now also bubbling through seawater from permafrost on the seabed. So the question is no longer whether the permafrost will start to melt, but if and when the time-bomb will go off. When it does, it will sweep the climate system away from our capacity to stop further dramatic “tipping points” being passed. All the carbon in the permafrost is equivalent to twice the total amount of all carbon dioxide in the atmosphere, so losing even a significant portion of it will create a very different planet from the one we know. Scientists are warning that the temperature at which it will be triggered is closer that we think. Research published in mid-2008 by Dmitry Khvorostyanov shows the trigger is warming in the Arctic of around 9ºC, and that once initiated it will maintain itself, leading to three-quarters of the carbon being released within a century. It could happen as early as mid-century. For these and many other reasons, I can only conclude that a temperature cap of 2–2.4°C, as proposed within the United Nations framework, would take the planet’s climate beyond the temperature range of the last million years and into catastrophe. “Two degrees has the potential to lead to three or four degrees because of carbon-cycle feedbacks”, says the University of Adelaide’s Barry Brook. • Because of the dangerous knock-on effects caused by its loss, the Arctic sea ice must be restored to its normal extent as fast as possible. • To get the Arctic sea ice back we need to cool the earth by about 0.3ºC. If we don’t, we cannot avoid very dangerous climate impacts. There is no third way. This is the new very inconvenient truth politicians seek to avoid. • To cool the earth fast enough to get the Arctic sea-ice back quickly, we need to move to zero greenhouse gas emissions as fast as the economy can be restructured, and is environmentally safe to do so, and take about 200 billion tonnes of carbon dioxide out of the air. We also need to find environmentally-safe mechanisms to actively cool the earth while navigating this transition. • Taken together this is a staggering task in terms of the necessary scale and speed of action, but there is simply no alternative if we are to avoid catastrophic climate change. Talk to most climate scientists, and they will privately agree. Many are already concerned that it may be too late (partially because of their very jaundiced view of the political elite up close), and they know that the politically accepted targets cannot be scientifically justified as likely to save the planet from disaster. This statement was endorsed by five [Australian] state-based conservation councils, and Greenpeace is also moving to this “new realist” position. And of all the large environment-oriented organisations, it was the Australian Greens’ Christine Milne who took the lead in recognising that “that the expectation of failure has become the norm in climate policy” and engaged with the zero emissions goal. So we can see a sweeping change in the public perspective of scientists and most environmentalists, whom opinion polls show are the two most credible voices in the climate conversation. Unfortunately, some of the more corporate-cuddle climate groups, trapped in a conservative mode of operation, are caught a long way behind the contemporary debate and the new, evidence-based understanding of the urgent need for zero emissions and the cooling of the planet back to a safe zone. 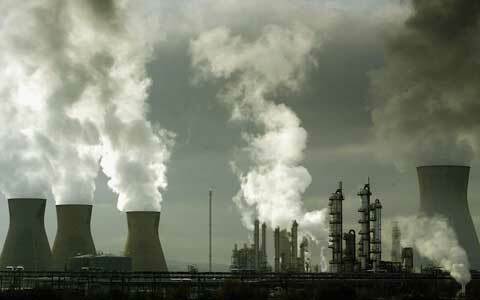 Stop all greenhouse gas emissions and cool the planet: it sounds impossible, but it is not. I am convinced that the obstacles to such a path are not principally technological or economic, but political and social. [Other speakers at this forum will be talking in detail about what those solutions can be.] Renewable energy is not rocket science, nor is electrifying our national train network, improving energy efficiency or planning to live sustainably. A McKinsey&Company report finds that many of the emission reduction opportunities are actually cost-positive (they cost less than they save in energy costs). And rebuilding a post-fossil-fuel economy will be job rich. Here is the key: the challenge of climate is politically transformative. In the dense fog that passes for the national climate policy debate, the major players stumble from one lamp post to the next, unable to see the bigger picture in the murky light. Devoid of context, their climate view is so constrained that they fail to identify the core problem: that the world stands on the edge of a precipice beyond which human actions will be no longer able to control in any meaningful way the trajectory of the climate system, or the fate of human life in a rapidly degrading natural world. Climate policy is characterised by the habituation of low expectations and a culture of failure. There is an urgent need to understand global warming and the tipping points for dangerous impacts that we have already crossed as a sustainability emergency, that takes us beyond the politics of failure-inducing compromise because we are now in a race between climate tipping points and political tipping points. Our political leaders are not taking the actions that the science demands, because the conventional mode of politics is short term and pragmatic. It seems to be about solving 10% of the problem, or blaming the other side for problems, or putting it off until after the next election, or pretending it doesn’t exist at all. Politics is more and more spin and less and less substance. Australian Prime Minister Kevin Rudd and [climate change minister] Penny Wong have adopted a traditional Labor Party approach to the climate problem: something for the environment lobby and something for business. But the problem is that solving the climate crisis cannot be treated like a wage deal, with the demands of each side balanced somewhere in the middle. It is not possible to negotiate with the laws of physics and chemistry. The planet cannot be bought off. There are absolute limits that should not be crossed, and doing something, but not enough, will still lead to disaster. They seem wedded to market-based solutions rather than having the imaginative capacity to construct a future nation in which we will actually be able to survive. We face systemic breakdown. Speed is of the essence in making the transition to a post-carbon economy as quickly as humanly possible. We cannot wait for the market to build a sustainable society. We all have to be part of it. Even the President of France has declared that “laissez-faire is over”; Sarkozy said: “the idea that the market is always right is a crazy idea.” Britain’s Nicholas Stern says global warming is the greatest market failure of all time, so in climate policy what do the major parties turn to: a carbon market! The climate crisis will not respond to incremental modification of the business-as-usual model. Fortunately we have another model we can turn to when we really want to fully solve a problem: emergency mode, whether it be flood or fire or tsunami or earthquake. In these circumstances we don’t wait for market mechanism or price signals or policies that will be implemented in 2 or 3 years time to solve it. No, government authorities go and directly apply the people and resources to fully solve he problem. The same is true in war time, where the government controls the economy to produce what is needed quickly and efficiently in order to solve the problem. In war if you only half solve the problem, you lose. The same is true of the fight against global warming. What we need to do is recognise, as people such as the UN Secretary General, the head of the UNFCCC, the Victorian state governor in launching Climate Code Red, and many others have said, that we face an emergency that requires emergency action. The climate emergency requires leadership and courage, and an imaginative capacity almost completely lacking in Australian politics today. We need to inspire people with the idea of transformative action, the willingness to promote a new vision of the future and make it the number one goal of our society and economy. It requires governments to put much of the enormous wealth generated by our economy into the solving the climate crisis. So how much economic capacity should be devoted to making the necessary rapid transition to a post-carbon society? The only realistic answer is that we must devote as many resources as are necessary, and as quickly as possible, to the climate emergency. During the last global mobilisation, World War II, more than 30 per cent, and in some cases more than half, of the economy was devoted to military expenditure. Yet today we have a delusionary public discussion about how spending 0.5 or 1 per cent on the problem is too much! We need to be prepared to make that level of commitment again if it is necessary to save most humans and species from a global warming apocalypse. Shifting to a war-type economy will require us to live better by consuming less as we rebuild a sustainable society. We can’t drill and burn our way out of the current crisis. But, working together, we can invest and invent our way out. If politicians cannot lead, then we all must, in building a movement across society that uses the brutal reality of our position to advocate and inspire the nation to take transformative action. We can only play this game once. If we don’t do enough, or at sufficient pace, in building a post-carbon economy, the climate system will get away from our capacity to correct it. Trial and error climate policy is not an option. Waiting for the market is not an option. The Arctic is our Pearl Harbor. And the impacts will be global and overwhelming. For example, the scientifically conservative 2007 Intergovernmental Panel on Climate Change (IPCC) report said that the Himalayan glaciers might be gone by mid-century. One-sixth of the Earth’s population relies on the melting of glaciers and seasonal snow packs for water, yet the federal Labor government’s unofficial target of 3 degrees is consistent with their destruction. Taken together with those on the neighbouring Tibetan plateau, the Himalayan–Hindu Kush glaciers represent the largest body of ice on the planet outside the polar regions, feeding Asia’s great river systems, including the Indus, Ganges, Brahmaputra, Salween, Mekong, Yangtze and Huang He. The basins of these rivers are home to over a billion people from Pakistan to China. The Himalayas supply as much as 70 per cent of the summer flow in the Ganges and 50–60 per cent of the dry-season flow in other major rivers. In China, 23 per cent of the population lives in the western regions, where glacial melt provides the principal dry season water source. The implications of the loss of the Himalayan ice sheet are global and mind numbing, but such a calamity rarely rates a mention in Australia. Do our politicians understand how global warming impacts in the Himalayas will unravel the lives of a billion people? In their letter to Garnaut, the grassroots climate groups asked: “What are our values here? Should we ‘wait and see’ if the whole world will act, before we do? Or should we take the only possible moral course and do what we need to do now, without waiting, because if other nations were to act similarly it may be possible to stop those billion people facing a catastrophe beyond words? Sir Nicholas Stern said that climate impacts were likely to be greater than the two world wars and the Depression put together, and that’s on the light side. When profligacy wrecked the global finance markets in 2008, governments and central banks readily stumped up more than a trillion dollars to “bail out” the economy. But when profligate human carbon emissions threaten the planet, such a rescue plan is not even the subject of serious conversation. Perhaps we may take solace in the thought that when global capital, at whose behest most governments rule, understand the new climate realism and conclude that they can’t build an economy on a dying planet, then those who have sat on their hands at the global negotiating tables will miraculously find the political will to plan and build a zero-emissions economy at great speed. Our role is to lead people across this nation to understand that the transformation to a sustainable society, and rebuilding our economy, is now an emergency.